You can offer thoughts on their blog (linked above), twitter (use the #egelements hashtag) or, of course, below. Go explore it – you might find a few new tools to investigate. No-one can ever make a perfect table like this – people’s needs and views differ. This one is understandably biased towards genomes and DNA-sequence oriented tools; it’s from a genomics conference after all. Someone with interests in, say, structural bioinformatics is likely to be disappointed. In that sense, perhaps this ought to be The Elements of Computational Genomics? My own initial thought, however, was that to me the elements of bioinformatics are not the tools but the underlying concepts that the tools are built from. It’s unfair of course as being a periodic table whatever they choose to cover has to be the ‘elements’ and they’ve chosen to cover tools. Still…! They’re asking how to improve this and present it on-line – currently it’s only available as PDF files. 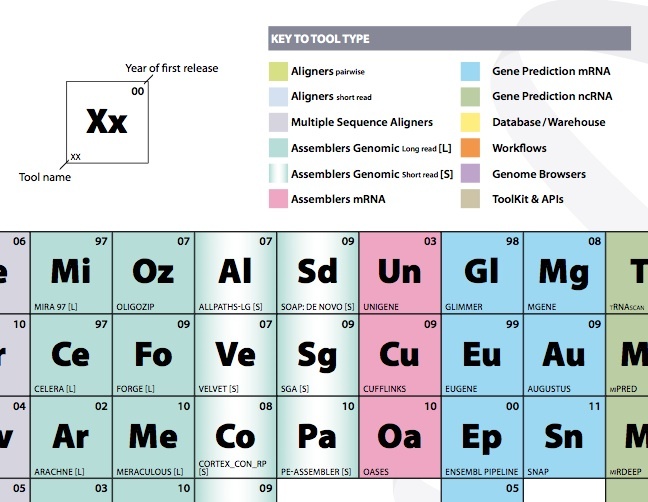 One thing I’d like to see if they make it into a web page, like many periodic tables of fields already out there, that they use roll-overs to tell you a little more about the tool and link to their websites. Thanks Grant – nice write-up. A dedicated website for this table is something we’d love to do. Thanks Richard. Hope to catch up with you in Cambridge (will email).